my eyes were bigger than my hoop house when I ordered ranunculus and anenome corms last fall. turns out 2500 will fill an entire 48′ x 20′ footprint with little room for paths, let alone the planting of early spring seedlings. In a panic, I applied for a grant from the NRCS for two more unheated greenhouses. I was hoping they’d come through by march so I wouldn’t have to face the impossible algorithm of plant placement, but still no word. with nighttime temperatures still hovering at 32 degrees, I’ve had to get extremely creative with protected space. I did manage to plant a center row of tulips, which are now being relentlessly ripped out as soon as they bloom to create space for other plants. the fencing will host a crop of sweet peas, started from seed in late february and happily transplanted. I haven’t grown sweet peas since my first season when I had no idea what I was doing. 3200 lisianthus plugs were delivered, along with campanula and more delphinium (go UCONN! 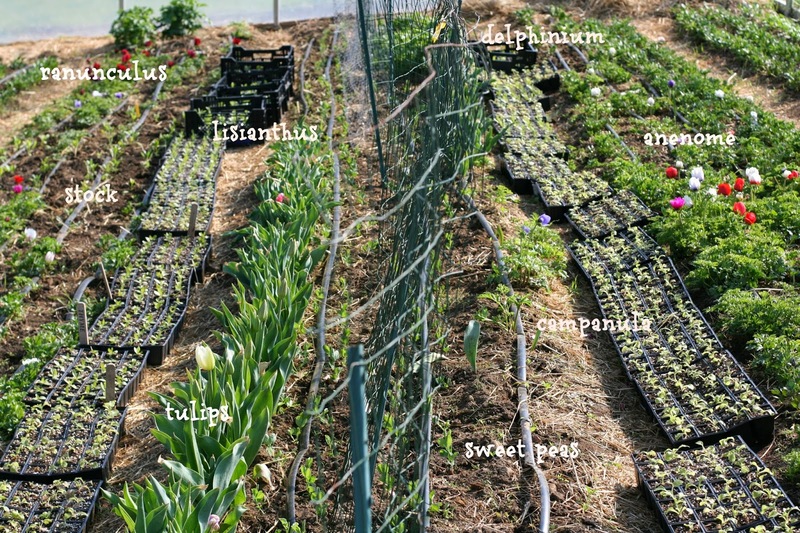 ), each needing to get transplanted up because there is no room in the inn, and it’s still too cold to be planted outside. as for the ranunculus and anenome, they survived the battle with winter and are beginning to send up triumphant blossoms. Another flower farmer just like me I bought about 2500 anemones and ranunculus and when they are pre-sprouted they are a lot bigger than the little bag they came in:) Keep on the NRCS.